Television journalist Balfour (Pretty Girl in Crimson Rose (8), 2003) paints a laudatory portrait of the nursing profession, briefly sketches a public hospital in perpetual financial crisis, and looks grimly at the society it serves. The author garnered his material through observations, casual conversations and interviews with staff at the Regional Medical Center in Memphis, Tennessee. (Their words were evidently tape-recorded, for quoted conversations make up a large portion of the text.) Balfour focuses on the life, careers and, most of all, the daily work of nurses in an assortment of areas: AIDS, neonatal, and burn units; anesthesia; trauma; OR; and obstetrics. He covers nurses who fly with emergency helicopters, the hospital’s chief nursing officer, and the vice president of patient services. All his featured nurses are female, but he makes it clear that the profession is attracting men in increasing numbers. Salaries for those with advanced training, such as nurse practitioners and nurse anesthetists, are quite good, in some instances around $100,000 a year, and even for those without special expertise, money does not seem to be an issue. Balfour’s nurses appear more concerned about being spread too thin and not having the resources to do their jobs well. Conversations with administrators reveal that every year there is a budget crisis, and every year brings threats of closure for the hospital, whose patients are mostly uninsured, unemployed and uneducated. “Self-pay,” he learns, generally means “no-pay,” raising the question of whose responsibility it is to pay for those who cannot. During Balfour’s year at the hospital, he became a familiar figure to the nurses, who openly shared with him their feelings about patients under their care. Expressing genuine concern for their charges’ physical well-being combined with impatience over their behaviors and dismay at their attitudes, nurses’ comments trace a dreary landscape of the inner city served by the hospital. 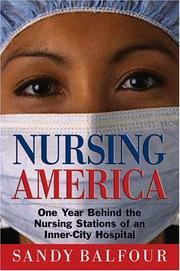 By contrast, the author’s depiction of the nurses is unfailingly glowing. A thin piece that too often reads like a press release.